There wasn’t a dry eye when I departed Jazzebelle this morning. I think they were eager to see me go. The evidence was building; they brought me to a port with no booze, they were up before me this morning, they all came to the ferry pier to see me off and they formed a human barricade to keep me from getting off the ferry. I can take a hint. In the cab from the ferry dock at marsh harbour to the airport I counted at least six liquor stores and a plethora of bars and restaurants. I would rather go back out into the teeth of the Gulf Stream than spend another four hours at the worst airport in the world at Marsh Harbour. They have a brand new terminal next door but because the design was overrun by politicians it can’t open because it won’t function. However, I had a great BLT sandwich. There was almost an incident when I thought the food vender called me white bread…incident quickly averted when she with a questioning look on her face said “or whole wheat”. It was a great sandwich. The coffee however was not great. I have grown accustomed to Dawson lovingly hand grinding the beans and producing pretty damn good coffee. Even at sea he found a way to get us our daily or sometimes twice daily fix. 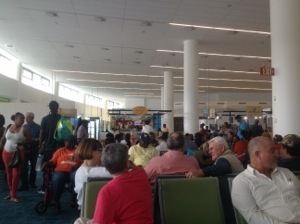 In contrast the terminal here at Nassau is brand new. First sleep in a real bed in 15 nights. Dry land is still moving. Bunch of bahamasair flights delayed, OMG. First replacement plane rolled out and the starboard engine was belching white smoke…they rolled that baby away and brought out plane number 3. We all piled on board like lemmings… My seat was taken by the one of the grade three dance competitors on the plane. The mothers shuffled me to the back of the plane where I was rescued by the training supervisor flight attendant person who asked if I wanted to go ride one of the aft facing jump seats and man the emergency door. Holy jeezuz she could read my mind, a hand on the emergency door was just what the doctor ordered. The remainder of the flight was uneventful. I still have three weeks in the BVI with Rick. I’m on a mission from God. We are still mopping up the tears. Just not the same without you.